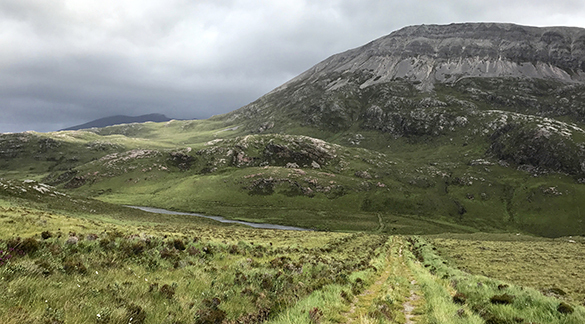 I first walked the stalkers’ track near Scourie in Sutherland, Scotland in 1982. Each return is a nostalgic and near-spiritual experience. 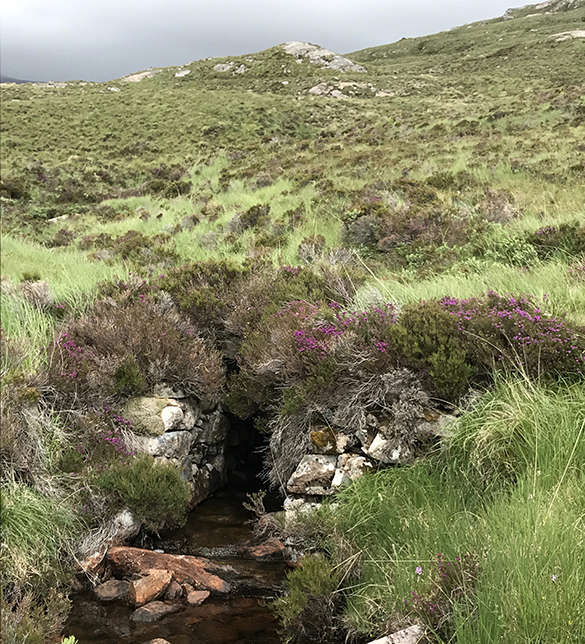 This ancient and glaciated landscape is home to red deer, adders, tiny frogs and countless bird species including an occasional golden eagle. The lochs teem with small brown trout. The only sounds are the wind and the mournful call of golden plovers. That same wind carries a peaty fragrance with hints of heather and bog myrtle. This is a place that fills the senses and lifts the soul. For some reason, maybe to look at a wild orchid or one of the small carnivorous plants that can be found here, I step off the track. I notice a wonderful little dry stone bridge that I must have walked over twenty times. I have never thought about how the track, that must have been laid at least one hundred years ago, actually crosses the multiple small streams that flow off these hills. I am fascinated. My canine buddy tells me I should look at this from the other side. Just fabulous! 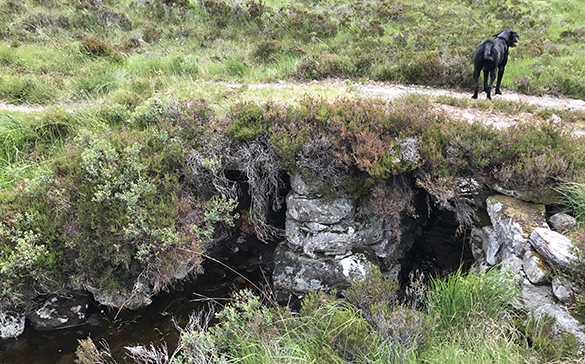 To think, through its existence, this cementless structure has withstood floods and snow drifts together with the weight of human traffic whether on foot, horse and carriage or landrover. A kilometre along the track, I find another but with a single span. 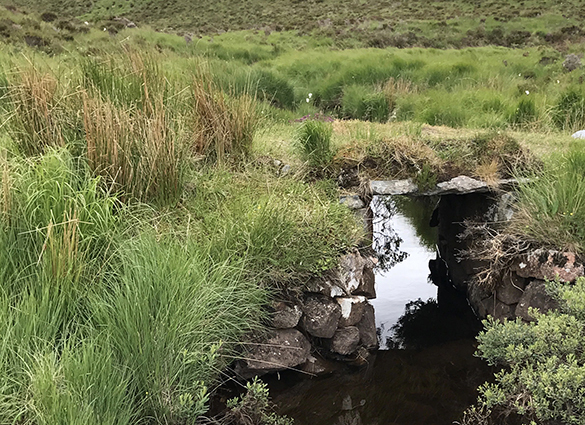 I notice these hardy little bridges are constructed from stones available on the spot. Large stones are stacked and stabilised with small stones wedged in. 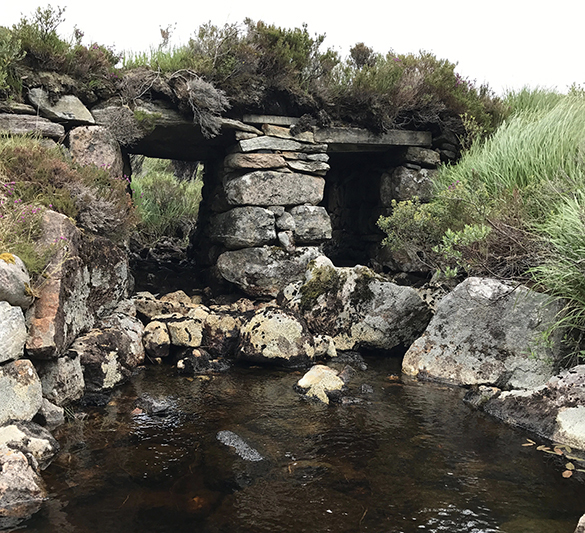 Maybe flatter stones were hauled in to make the cross pieces but it is difficult to look at them closely; they have been here for so long that they are now covered with heather and are just part of the track. As with the dry stone walls in this part of the world, I admire the skill and plain hard work of the unknown master crafts(wo)man/men who created these little gems. These bridges have a rustic, aged beauty accentuated by how they are now integrated into the environment. I find a third; it is so overgrown that, to see it, I have to step into the stream bed. My day just gets better. Who else has noticed the dry stone bridges of the stalkers’ track? I wonder if I have happened upon a long-forgotten little bit of antiquity. Does or should some kind of preservation order apply in the event of maintenance or upgrade of the track? I try to contact the office of the estate concerned but without success. An internet search reveals nothing about these bridges (but I find there are courses on how to make one!) Is there an engineer-historian out there who knows about them? It would be great to hear from you. Take a look at this fabulous tinkly musical puffer fish we found at Art Geneva 2016. 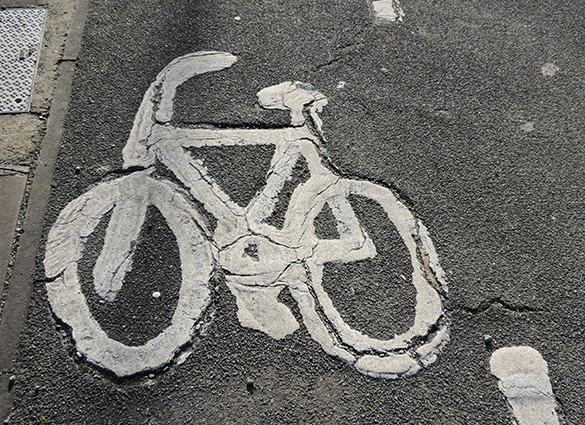 You assume somebody designed this logo that you find on every 30 metres on every cycle lane in the city of London. And then you wonder if he or she thought ahead to how it would, with sun, rain and frost over the years, evolve from stencilled traffic designator to cracking and rather beautiful urban feature. You’d like to think so. On yer bike Andy Goldsworthy! We found this great shaking zombie at Art Geneva 2016. The heatwave in Geneva is severe. The place is going crazy! I head for my favourite mountain destination. The little village of La Fouly is high in the Swiss alps. It is tranquil and blissfully cool. My hike takes me past the discrete chapel that hides among pine trees. It is unassuming. From the outside, I see neither overpowering crucifixes nor demur madonnas. What catches my eye is an exquisite little bronze relief by the door. A bearded man kneels. His hands are clasped. He has a rosary around his wrists. I am not sure if he is in prayer or contemplation. The work resonates with the chapel’s simplicity. This is J.J. Tornay’s representation of the ascetic recluse Nicolas de Flüe. 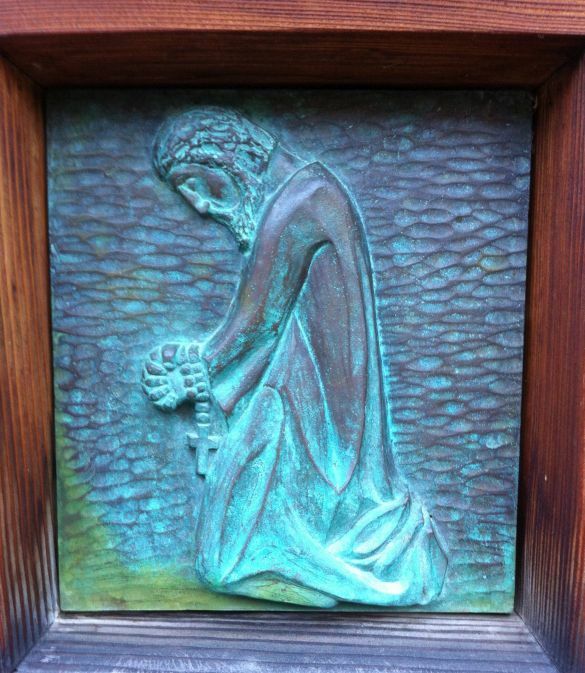 If you find yourself in La Fouly, (and even if your spiritual beliefs, like mine, idle in neutral) take a stroll by the chapel and stop for a minute before Tornay’s little masterpiece. It exudes peace and quiet.